Yes I finally got some time to sew! 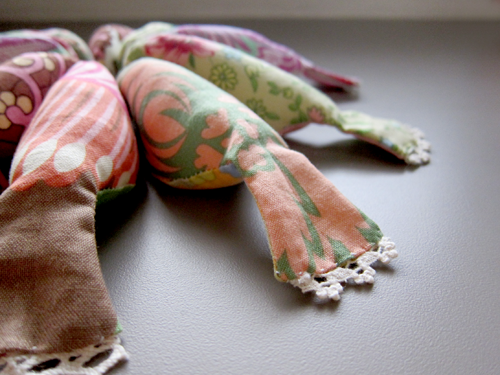 I’ve got more Amy Butler fabric remnants left and I’ve been wanting to make more stuffies and I settled on this one. It started as a project just to make them as stuffed toys but since my cousin and cousin-in-law both delivered baby girls, one last november and the other last week! 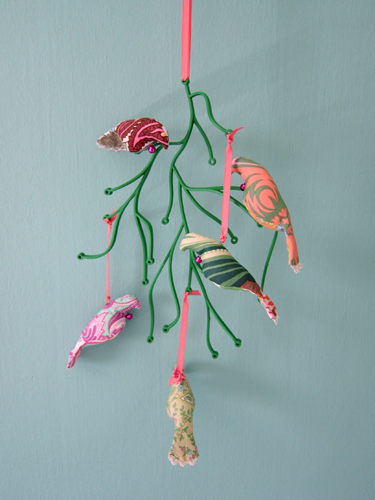 I decided to make them into hanging mobiles. 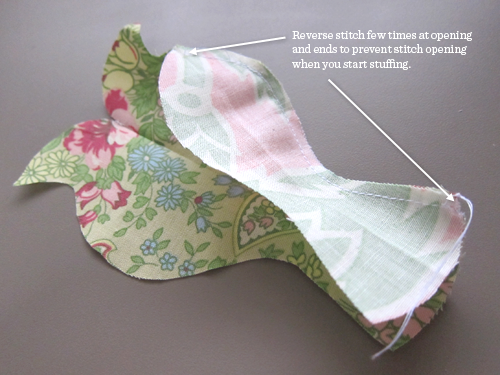 I got the sewing template here from Spool Sewing. I made the template size smaller for my use. I imagine making a much bigger one… maybe soon. 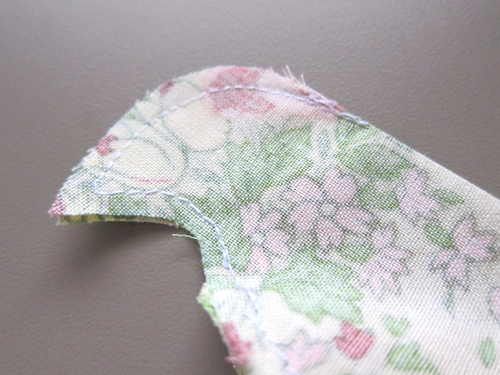 (: I also added some lace to the bird’s tail for some detailing. 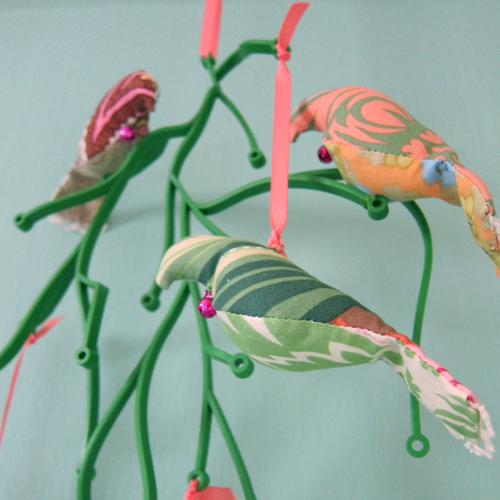 Instead of twigs, I used Vitra Algue and made two hanging mobiles. I think it’s the experience I acquired when I made the owls so I think I took less time and effort with the birds. I’d say the difficulty level is about 1 to 2 out of 5. 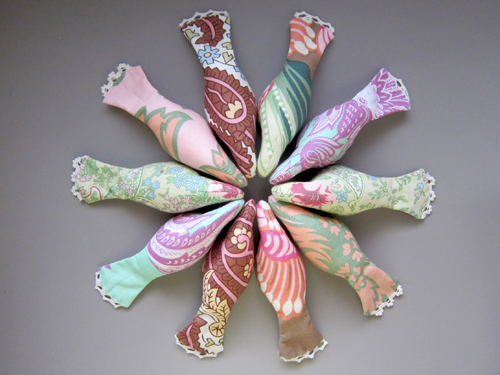 They do make lovely gifts and can be sewn on to anything. 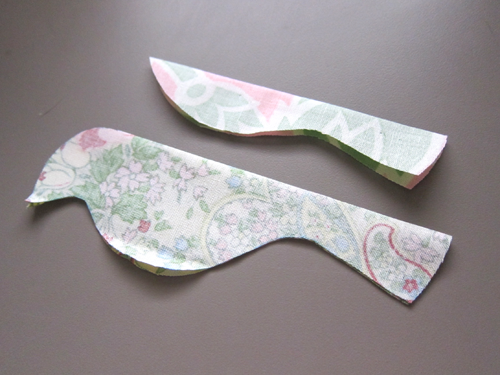 I’m even toying with the idea of making them into brooches. That’ll mean tweaking the shape abit. If I do, I will post the template up. 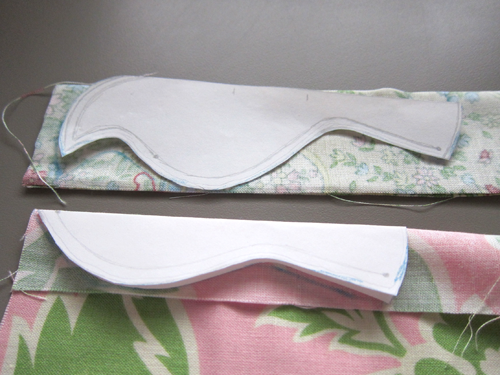 Placing the templates onto folded fabric. 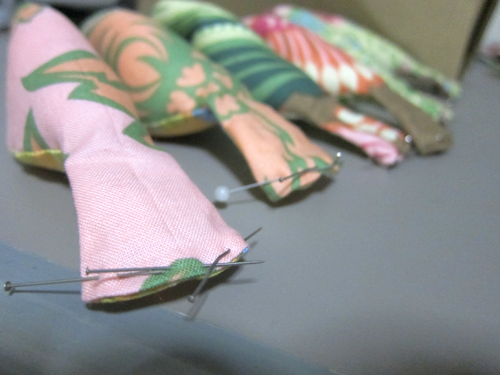 I choose to sew the head first. 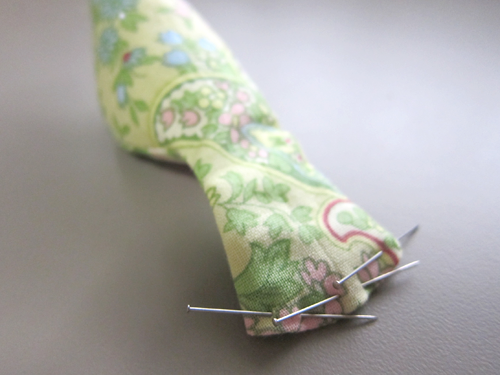 I found it easier to match the fabrics properly. Try it, and see what suits you better. 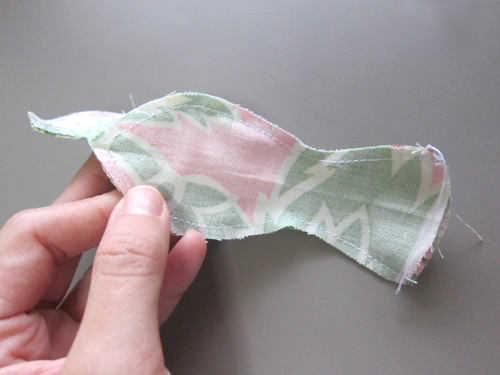 Lastly, sew the other side. 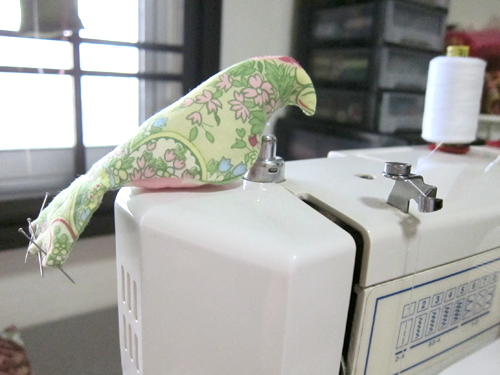 This is all the machine sewing needed. Flip bird inside out. 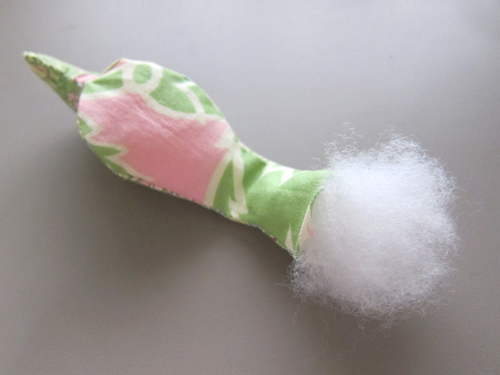 Tail is left unsewn for the stuffing. 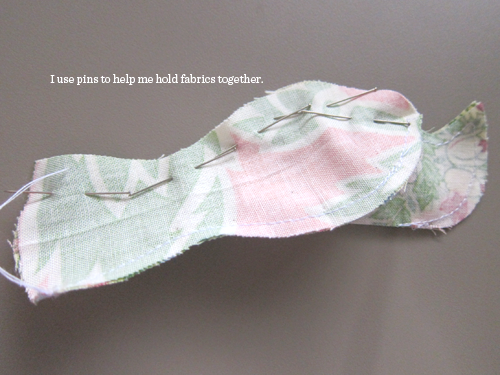 Fold the seams in and use pins to hold until you are ready to hand sew. All 10 of them! I added some lace detailing to their tails. They remind me of prawns! Closeup view. They look like they are in a meeting. Hah! 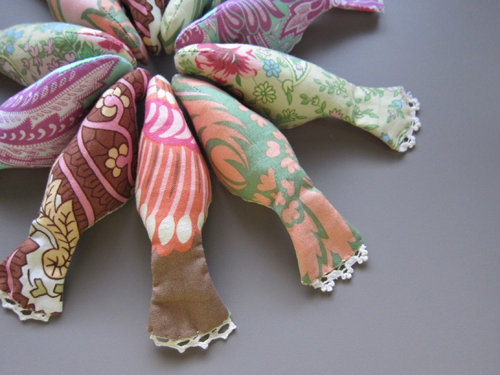 Top two birds are sewn on the Vitra Algue. The rest are attached using ribbons. I also added tiny bells on their necks for sounds. Done! I’m pretty happy with the results. Party’s next weekend and I’m really excited about giving them to my cousins. Hope they like it.